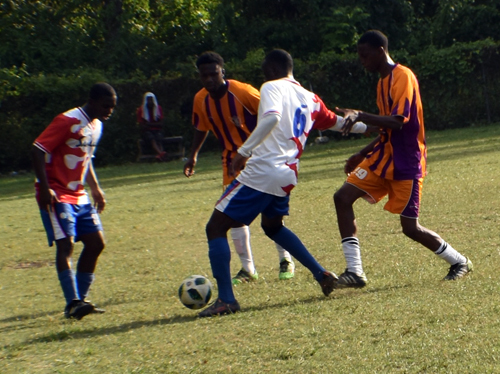 At 5:20 p.m. later today, Monday, April 9, the first finalists in the St. James Football Association Sandals/ATL Divisional One League will be known, when Cambridge tackle Bogue in the opening semi-final game set for the UDC field, beginning at 3:30 p.m.
Former champions Violet Kickers and promoted Clubville clash in the second semi-final on Wednesday, April 12, at the same venue. The four were confirmed qualifiers following the final series of rescheduled games contested. Promoted Cambridge, who stormed into the last four losing just a solitary game, qualified top of the pack with 21 points, well clear of Clubville, 17, the other promoted side. Clubville’s prospects were significantly enhanced following two rulings in the boardroom. Violet Kickers amassed 16 to seal their berth and Bogue, three points adrift, with 13. Bogue, who missed the semis by a single point last season, sealed the fourth and final slot on Thursday evening, April 5, putting out Fire House’s hopes, after sharing six goals down the middle with Lane in an entertaining affair. Top striker Christopher Johnson, who had been off the scoresheet in recent games, fired home a timely brace to inspire Bogue’s come-from-behind performance, netting in the 16th and 17th minutes. Kirkland Patterson, in the 53rd minute, was the other scorer for the Bogue team as they held off their opponents who charged with two goals in as many second half minutes. Otis Anderson, who had silenced the Bogue team when he opened the scoring in the 13th minute, ended with a double for Lane, adding the other in the 68thminute. Dejour Alexander clutched a point for Lane when he popped up in the 7th minute for the final equalizer. Meanwhile, the game between Paradise and Clubville, which was of academic interest as the latter could finish no higher than second, was not played. Ville were also on the favourable end of their game which ended prematurely with Copperwood.